I have had some bad experiences with push caddies before. I once bought a push caddy whose wheels gave out three months into owning the thing. The wheel just snapped clean off of the axle. When I went in to investigate the problem I found that the wheel had rusted where it met the axle. The wheel popped off right in the middle of a round too. I was on the 8th hole of my round and had to carry all my bags and gear the rest of the way. I don’t know about you but I don’t live in an area where the sun shines 24/7. I left that old push cart out in the backyard a couple of times and the rain rusted away the axle. Now I am a golfer and a consumer and I take my role as both very seriously. As a golfer, I need products that will help me play and enjoy the game. As a consumer, I need products that are dependable. So for my money, the best investment I ever made in a push caddy was the Caddytek Caddylite EZ V8 and allow me to tell you why. Now you may be rich enough to be able to afford your own personal caddy 100% of the time but for the rest of us push caddies like the CaddyTrek Caddylite EZ V8 become necessary. That is because products like these allow us to play our game and not have to worry about much else. 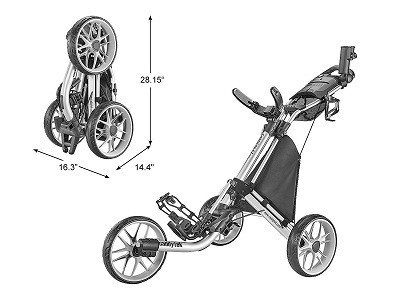 First of all it is a very lightweight push cart (just over 18 pounds) which means the golfer does not have to worry about breaking their back lugging it to and from the course. Now a lot of times lightweight pushcarts can’t carry heavy loads but the CaddyTrek Caddylite EZ V8 sports a sturdy frame and a wide enough stance to stably hold heavy bags and gear. The rear wheels stand a good 16 inches apart from each other when erected. The CaddyTrek Caddylite push caddy saves time too. In order to fold it down all you have to do is press a button and the whole thing collapses and shrinks down to half its size in 2 easy folding motions. I have personally come to appreciate this feature because it makes it so that I can spend more time on the links. CaddyTrek seems to really understand golfers. The CaddyTrek Caddylite EZ V8 has features that golfers can really use like a built in score board and umbrella holder. For those who like to enjoy a beverage or two or three between holes, this push cart comes with its own cooler. The push handle can be adjusted to three different heights as well. I am a man of above average height and the highest allows for me to push the whole apparatus comfortably. What I like the most about this push caddy is that it can stand up to the elements. My old push caddy was rendered useless by some rain but the 3 EVA wheels are built better than that. I can leave the whole thing out in the rain without worrying about rust ruining my cart. The wheels are a good hefty size too. They are all 11.5 x 2.6 inch and they roll easily over multiple kinds of terrain. Even when I get the ball in the rough, this thing keeps up with me. The features of the CaddyTek Caddylite EZ V8, such as the quick fold down process, the built in cooler and resilient design, make it a worthwhile buy. Even in light of some of its shortcomings I would still enthusiastically recommend this push caddy to any golfer I know. For me, the CaddyTek Caddylite EZ V8 is the best choice because it saves time and I don’t have to worry about it falling apart on me. That is just me though. You are sure to find a reason of your own to rock this cart so try it out for yourself!